“I felt numb. I didn’t really know what to feel. I didn’t even cry until I got on the bus the next day, and that’s when it all hit me,” Talilo Marfil said. He was talking about his son’s death. At this year’s Story Arc workshop, led by SOJC Multimedia Journalism master’s program co-directors Sung Park and Wes Pope, the other members of my team and I learned what it means to enter the dark territories of someone’s past in order to tell his story. We were the green team, coached by Andrea Wise, an accomplished photographer and editor from New York. Our simple goal was to make the world a better place through visual storytelling. 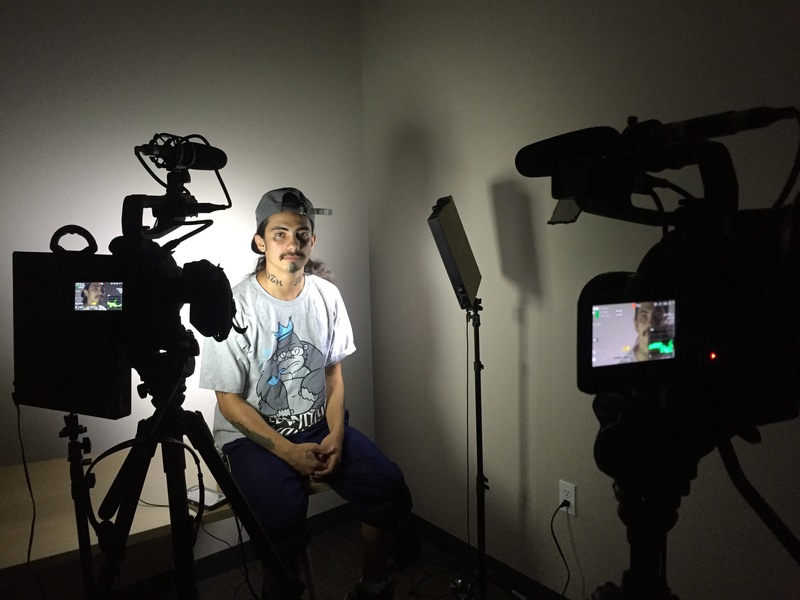 Supplied with cameras from Canon, monitor-recorders from Atomos and coaches who would push us hard, we were more than ready to tell an impactful story from the streets of Portland. Marfil, 26, was homeless in his teens. He had an abusive father. He was addicted to meth. He remembers having a pistol, robbing people and contemplating suicide. His mother contracted cancer while he served time in prison. He held his deceased son in his hands after he was born. These dramatic circumstances amounted to a lifestyle that, to him, was overdue for a change. Marfil said hearing that his mother had cancer was a defining point in his life. “It made me want to change the way I was living because I couldn’t be there for her at all,” he explained. He is has since embarked on a much different path: A hole he once filled by hurting others is now filled with purpose. Today, Marfil is a teacher for Step Up, where he uses rap music, one of his biggest passions, to teach school subjects. He has also used his music to mentor Portland’s youth, and he is on the board of directors for Outside the Frame, an organization that gives homeless and marginalized youth opportunities to make and appear in films, gaining real-world experience. The day I met Marfil — the first full day of the Story Arc workshop — I rose from bed at 4:45 a.m. I unplugged the batteries from the wall that had charged during my short night’s sleep and placed them into my Canon 100’s battery slot. After I got dressed, I skipped my morning shower to eat a quick snack at a nearby Starbucks. Thank God it opened at 5 a.m.
First, we filmed Marfil playfully waking his girlfriend up with a pillow upside the head and jogging with his dog along the waterfront. Then we ate lunch with him. Next, we filmed him working at Outside the Frame and walking through a homeless camp as he told his story. Over the next three days, we would film him rapping on stage at a nightclub, editing a music video in his college multimedia class and much more. Throughout the course of production, we learned much about the time management skills it takes to shoot a documentary. Following Marfil’s busy schedule wherever it led us, we gained hours of footage, knowing that we would use only five minutes of it. To focus our efforts, we brainstormed possible themes: finding hope, lightness and darkness, overcoming adversity. With these themes in mind, we could be more intentional on our shoots — one of the most important lessons I learned during the workshop. There’s no question that it took teamwork to build our film during the production workshop. We had long discussions about our story and often had to go back to the drawing board. Even during the post-production workshop, when our editor was the only one there, we discussed rough-cut previews she made via FaceTime and text messages. The coaches at this year’s workshop were incredibly insightful and experienced, and I appreciated their thoughtful feedback on the students’ work. Some of us presented samples of our work from the past to a large group and received helpful suggestions in return. This was our main classroom, but the majority of our learning came from shooting on the go, capturing our stories as they unfolded at a rapid pace. Eventually, our team found the story we wanted to tell. “I found beauty in the darkness,” Marfil told us in an interview. He was dealt a difficult hand in life, due both to poor circumstances and his own faults, but he found a way to turn it into something positive. This idea seemed to capture his story well. We tried to emphasize the darkness of his past visually in the film, which we wouldn’t have thought of doing had we not brainstormed themes. As we finished our last interview with Marfil and walked into the screening room to show a snippet of our film to the class, I was glad he was there to see it. The feelings of gratitude were mutual. At that point, he wasn’t just a subject in our film; he had become a good friend because of the trust we had built during the journey we embarked on together. Impressive enough that I learned how to reblog so that I could. Lovely post.